Another example of a poop polluted crag is Camarasa (Spain). That's actually the first place, where the gross nuisance really hit us on the face. The dense bushes by the most climbed sectors are full of toilet paper and poop! As you can imagine, it's near repulsive to push yourself forward in the thicket hoping, that the slippery stuff under your sneaker is just mud. The issue isn't limited to the mountains, though. It exists near popular surf spots as well. When me and T visited Peniche (Portugal), we were quite shocked to see used toilet paper even on some trails leading to the beach. 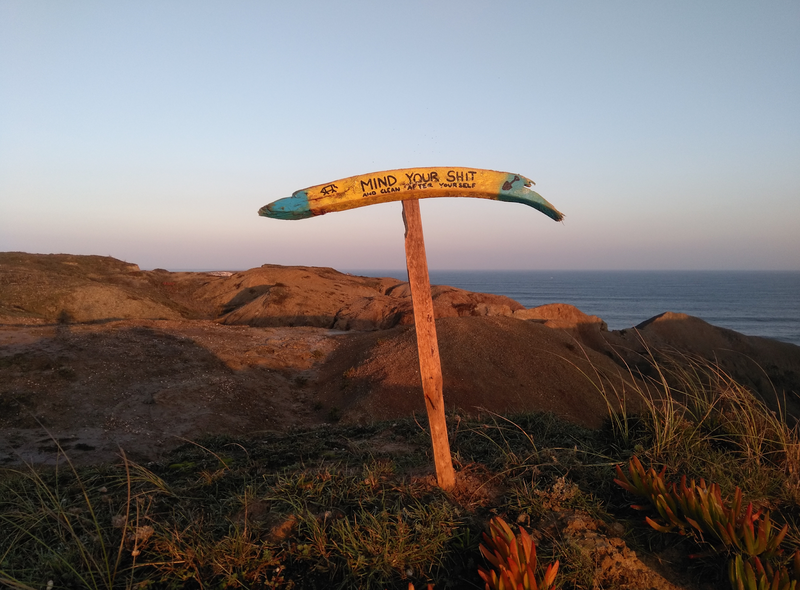 A couple of surfers actually set up signs encouraging people to clean up after themselves. The more I think about it, the less I can blame on the locals being quite fed up with surf bums (like ourselves, haha) camping near the beach. 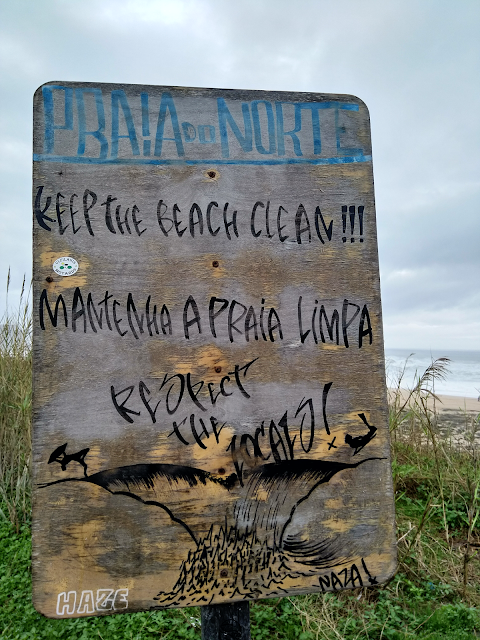 In Peniche, surfers have set up signs telling people to clean up after themselves. For what I've heard, its's the same in Sagres (Portugal). That's another surfer infested area, where free camping seems to be less approved than it was a few years ago. Of course poop isn't the only reason for putting up those “no camping” and “no autocaravanas” signs, but it surely is one of them. Another sign at a beach in Nazare (Portugal), telling visitors not to leave any trash behind. But there's something even worse than sh*tty toilet paper. Yes, I'm talking about intimate wipes! You know those damp, single packaged tissues? Intimate wipes don't compost as fast as regular toilet paper, but for some reason especially Spanish people seem to be fond of them. By now, I could've taken a million photos of used intimate wipes left behind, but I'll leave something to your imagination. Why am I writing about poop in the bushes? Haven't I taken a dump at a crag a few times myself? Of course, just like everybody else reading this blog. But even though I think it's ok to do it in the wild, it's not ok to leave the brownies on display. What people don't see, they can usually look through their fingers. That's to say, that in order to keep the landowner and other locals happy (or at least happier), I do my best to hide my poop. So, how about minding your own sh*it? It doesn't take that much energy nor time to cover up that stinky pile of yesterday's food. A couple of big rocks and a pinch of sand or dirt is usually enough to do the trick. Even if it's only an aesthetic act, it's better than nothing. Right? Another option is to dig a hole and do your business in it. The hole should be around 15-20 cm deep and 60 m from water. This is a more ethic solution, since your poop isn't polluting any water sources and it composts faster. Also the animals usually leave the poop be, when it's buried in the ground. I think Finnish climbers have invented the best solution to this problem, though. 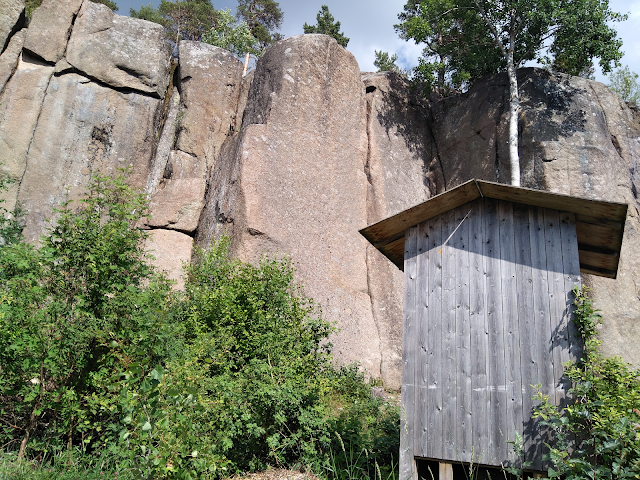 Namely, there's an outdoor toilet at Hopiavuori(Finland)! The crag itself isn't that busy, but that doesn't make the toilet any less practical or comfortable. And what's best is, that the toilet seems to be clean and well maintained. Outdoor toilet at Hopiavuori, Kustavi. You can even see the crag while sitting in there! I've also heard of so called WAG bags, that might be useful on a multi pitch. The idea is to take a dump in a bag, that has some deodorizer in it. The bag is then put inside another bag, which is meant to prevent any leaks. The bag system is made out of puncture resistant material, so it's not the same as using regular trash bags as a portable toilet. That being said, I have no idea where the poop bundles should be deposited. Do you? If you know how to dispose a WAG bag, tell me! Feel free to share other experiences on WAG bags, too.